HFD Members had a busy weekend starting a with a serious fire at Bobs Tire and Wheel at 136 Goffle Road Saturday AM. This incident was reported 01:41 AM as an activated fire alarm, quickly followed by residents which where awakened by the fire alarm on the second floor reporting light smoke in the apartments. Upon arrival police units reported smoke showing and Chief Speranza arrived calling a working fire. Engine Four arrived on scene and stretched a supply line to a water supply and two hand lines to the first floor which was the business. Engine One was assigned to the second floor apartments (access from North 8th St) to insure evacuation and a second attack above the fire area if conditions warranted and to insure fire extension was contained. Engine Three , Tower Two and Rescue Five provided secondary manpower and ventilation assisting the interior units operating. 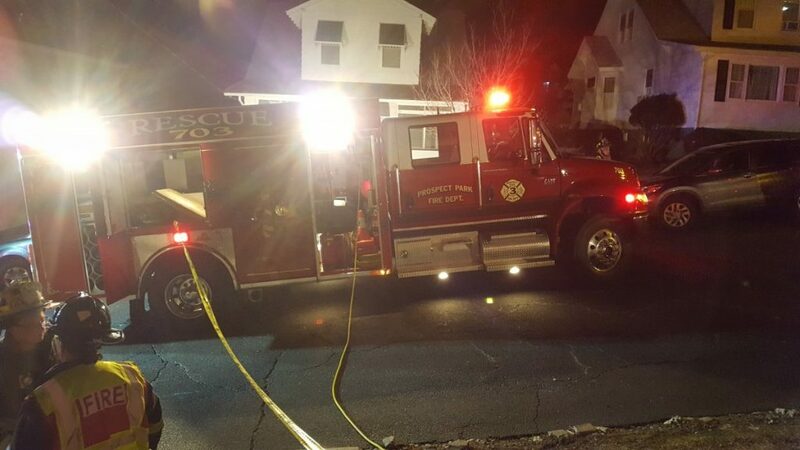 Mutual aid was provided by Glen Rock, Prospect park, North Haldeon and Wyckoff fire departments with coverage to the borough. The fire was brought under control in 29 minutes with significant damage to the first floor offices and smoke damage through out the business and families on the second floor where displaced for the night. 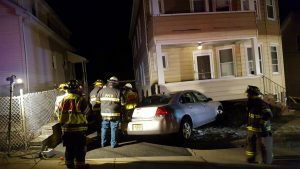 This incident was followed by two fire alarms and a gas leak for the weekend and topped off with a call for aid to our neighbors in Prospect Park. 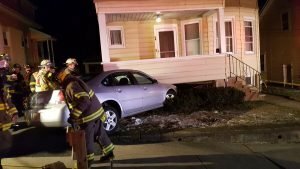 This incident required HFD Rescue 5 to be dispatched to 94 North 16th Street, Prospect Park on Sunday evening, 03/12 on an assistance call to Prospect Park FD for a vehicle that had crashed into a home. No information was available on the scene as to whether the vehicle, a 4-door Chevrolet sedan, was occupied at the time of impact. 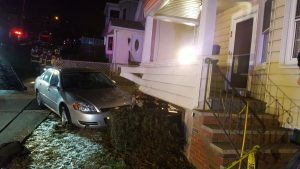 The vehicle was removed from the scene by a flatbed tow truck after Hawthorne FD and Prospect Park FD personnel shored up the front porch of the involved structure.